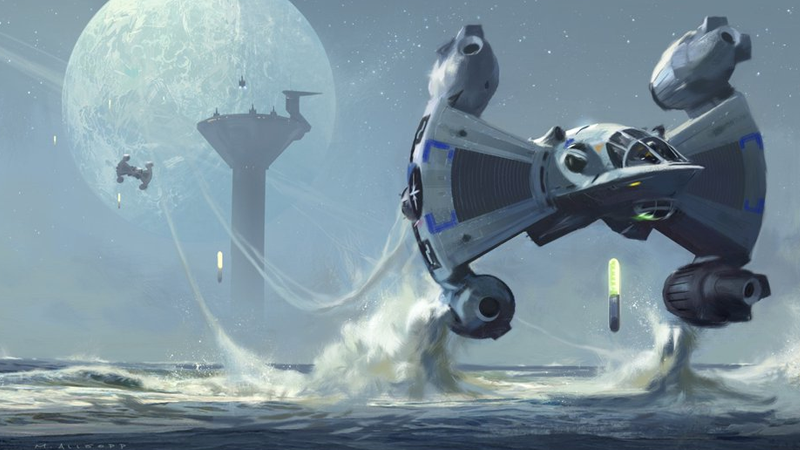 Concept art for a new Last Starfighter released by Gary Whitta today. On Twitter, Rogue One and Book of Eli screenwriter Gary Whitta just dropped a huge bombshell: He’s working with Jonathan Betuel, the writer of The Last Starfighter, to finally try and reboot it for the big screen. We reached out to learn more, and Whitta told us why now is the perfect time to bring it back. Whitta just nonchalantly revealed the project as “a little something” he’s been working on with Betuel, alongside four gorgeous pieces of concept art depicting the iconic ships from Nick Castle’s beloved 1984 classic, as rendered by Rogue One lead concept artist Matt Allsopp. There’s literally nothing else to go on right now, other than the fact that Whitta and Betuel are in the early stages of getting a reboot off the ground—something Hollywood has been trying to do for quite some time. So we reached out to the writer, and here’s what he had to tell us about his plan. io9: What’s your personal history with The Last Starfighter? Gary Whitta: It’s always been one of my all-time favorites. It is a deeply special movie for me. In terms of movies that stirred my imagination as a kid, it’s right up there with Star Wars. Maybe because I was a video game junkie back then, but the idea that playing a game could be a magic ticket to a real space adventure, I just always thought that concept was utterly brilliant. The film is sorely underrated in my view, although it’s endured as a cult classic and every time I bring it up in conversation people seem to just light up. There’s a tremendous undercurrent of fondness out there for it. Why was now the right time to bring it back? Whitta: The simple answer to that is Jonathan Betuel. Jon created and wrote the original movie, it was all his idea, a spec script he wrote while he was working as a waiter in Hollywood in the early ’80s. There was a whole bidding war over that script. In all the years hence, whenever I’ve brought up the idea of a Starfighter reboot in meetings, people would always convey excitement and then say that it’s impossible because the rights are a mess. It’s true that it’s not simple, but part of the key to it is, as I understand it (and I’m not a lawyer), Jon still retains some piece of ownership of the original IP, so no one can make a new movie without his participation. I happened to track Jon down, and after I was done pestering him with all my fanboy questions about the original film we started to talk about what a new version might look like. Since then we’ve spent so many hours working on it I’ve long since lost count, but right now we have a fully developed story that is a combination of reboot and sequel that we both think honors the legacy of the original film while passing the torch to a new generation. We’re both very excited about it creatively. What does it mean to you to be trying to bring this world back to the big screen right now in the midst of some other similar projects being developed? Whitta: All I know is, we’re trying really hard to make this a reality. It’s a passion project for Jon and me both. And I know we have a great movie here. But we still need to deal with some remaining biz stuff before we can really move forward. We’ve had a lot of talks with Universal. We’re determined, one way or another, to make this happen. Trying to create in Hollywood is always like pushing a boulder uphill, particularly when there are archaic rights issues involved, but we’re going to keep trying. That’s the lesson of Starfighter... when you get your chance you’ve got to grab it with both hands, and hold on tight. You tagged Seth Rogen on your reveal of the concept art on Twitter. Is he involved? Whitta: I know Seth is a fan of the original and he’s tried to get this done before too. We’ve chatted on Twitter about it. Personally I think he’d make a fantastic Centauri. We’ll bring you more on the Last Starfighter reboot as we learn it—for now, feast your eyes on those glorious Gunstars.